They take vacations so seldom, as cattle ranchers are prone to do, that this seemed like an exciting adventure they would not soon forget. It was. The following account was written by Kathy Starr shortly after they returned home five days later than they had planned to. 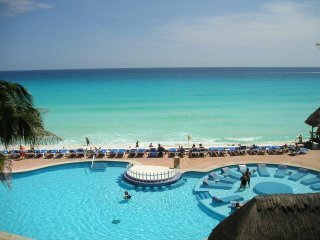 The fun began when our friends Norman and Phyllis Choat invited us on a 7 day long vacation to Cancun Mexico. This is the year of our sixtieth birthdays and being able to count the number of vacations on one hand, we decided to throw caution to the wind and go. Five days before departure we booked the trip with Funjet vacations. This would be our second trip out of the United States. Two years earlier we had been to Niagara Falls on the Canadian side. The only problem was getting Kathy?s birth certificate before departure. There was also a small tiny voice that said, ?should we be going to the Caribbean during hurricane season?? This thought was dismissed as there just couldn?t be any more as they were already out of names for hurricanes. We drove to Omaha, met the Choats and drove to Kansas City for a non-stop chartered flight to Cancun, arriving approximately 6pm or just before dark. We were bussed to our hotel, the Barcelo Tucancun, checked in, had supper and settled in. The next day, Sunday, was beautiful. The ocean was magnificent.We played in the ocean, soaked up sun, ate wonderful meals and were truly enjoying ourselves. Monday, more of the same, Tuesday an ocean fishing excursion, Wednesday a visit to a tiny island and more beach. Tonya called us Tuesday night and was concerned about the hurricane. We assured her we were paying attention. Wednesday she called again and said, ?you need to get out of there?. Our travel agent stationed in the hotel assured us we would be fine. Besides how could we get out of there? We felt renting a car and traveling the back roads of Mexico was not a very smart thing to do. 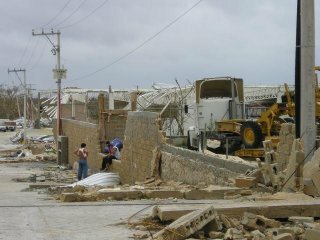 They were still bringing tour groups into our resort and the feeling amongst the employees was that these hurricanes always missed Cancun. Thursday morning the hotel gave us a letter asking us to decide whether we wanted to go to a shelter on stay in the hotel during the hurricane. In the next two hours, two more letters were issued. Around noon they told us there was a mandatory evacuation and no one would be allowed to stay in the hotel. We were allowed one blanket per person and two pillows. No luggage, only one small carry on bag per person, our passports and photo identification. The only information on our destination was that we were going on a jungle adventure. They loaded approximately 240 people, or all the guests from our hotel, on buses and our adventure began. The volunteer staff from the hotel was approximately 30 workers. Our trip was approximately 45 minutes, arriving at a brightly colored yellow and orange grade school.We turned off a main highway and the school wasn?t too far, maybe a mile from the highway. This was early afternoon. 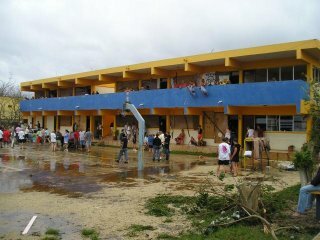 The school had three buildings. One, one story building, one two-story building, and one three-story building. We were placed in the two-story building which faced south. The other two buildings were to the east of this building. There were approximately five 24x24 classrooms on the ground level, plus bathrooms and approximately five classrooms plus a stairway on the upper level. These building were cement buildings with blind type windows the full length of the north and south outside walls. The south side had roof extension of approximately six feet. This was also cement. It appeared that English was taught in our classroom, which was in the middle on the ground floor. Also the ground floor was two feet up off the ground. There was a large cement slab for playing basketball and a cement stage on the west end in front of our building. Upon arrival the staff had us file into our rooms. They said thirty to forty per room, we claimed our real estate, one blanket folded in half for two people. Outside we were all given one two-liter bottle of water and watched them unload approximate 20 five gallon water bottles for drinking water. Food, toilet paper, games and cards was unloaded and carried to the building with three floors. There was a kitchen on the lower level of this building. We spent the afternoon visiting and speculating. The men shot basketball hoops, some kicked balls into the soccer nets, some played cards. They fed us a nice meal, boarded up all the windows and sent us to bed at dark, 6:45pm. We had lights and the door to our room was left open. In the night the wind began, we could hear large crashes and glass breaking all night. We lost our lights approximate 3:30 in the morning. I went to the restroom in the night and there appeared to be a foot of water on the cement slab. Before we lost electricity, one of the boards blew off of one of our windows, allowing the water to come in our room. Norman kept the water mopped up but there was no way to keep it from coming in. We all had to snuggle up closer as we lost a quarter of our floor space. Friday morning we awoke to more rain and strong winds making it too uncomfortable to be outside for very long. We all had to use the restroom and most found themselves outside under the eves of the building tolerating the rain and wind. They had us all walk upstairs for a cup of coffee. Around noon they brought us a muffin type sandwich to our rooms. This was our meal on Friday. At approximately 2pm they shut our doors and we were inside again for the duration of the afternoon and night. The wind seemed to subside and we did not hear so mush crashing and banging, probably because most of the damage had already been done. Saturday morning we awoke to more of the same. There was not as much rain. The day was the same as before; we stood outside in the weather just to get out of the room. I wished I had some kind of jacket and could not stand the smell of myself. We got coffee again and it was safe enough for us to stand in line for coffee and later tuna and crackers. We had tuna and crackers on Saturday. In the evening there was hot chocolate and coffee. There was not enough hot chocolate to go around. The last thing we needed was something to keep us awake on the cold, hard ceramic tile floors. Most tried not to drink too much water as the trips to the bathroom were anything but pleasant. We learned the storm was back and another night in the shelter. The winds sounded worse this night, there was just nothing left to blow over or uproot. Sunday morning we awoke to slightly windy but calmer. We cheered at being able to be outside. The number one question was when do we leave. The problem was, there was no place to go back to. We were told our luggage would be mailed home and our travel agent who stayed with us the entire time left to walk to his office, saying he would be back around noon with news. We knew we were in trouble when he arrived back at 10am. The news was that the lagoon and the ocean were one, meaning the entire hotel strip was under water and the airport had sustained severe damage making it impossible for planes to fly in and out. We knew there were 33,000 stranded tourists. The day was good and everyone could be outside.They fed us tuna and crackers twice this day. I could not eat but only the crackers. 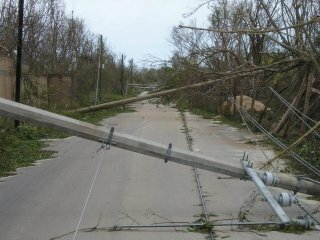 With all the leaves stripped off the trees and many large trees uprooted, we could now see we were surrounded by houses. In our group there was a man named Ashley from Scotland. He was a big man approx . 6?7?. He spent the first day returning soccer balls and basketballs and in general being too active for the rest of us. We worried he would wear himself out. The first night in the storm he scouted the town for everything including food. He knew the town with stores was 8-9 blocks away. Everyone made the trip out buying pop, chips, tequila and cigarettes. We walked over and under power lines, past huge houses and smaller houses. We learned we were in a better part of town. All of the big houses were surrounded by cement block barrier fences for the purpose of keeping people out. Many of these barrier fences were blown down. In one yard there was two Lincoln continentals and another yard had maybe 12 white vans. These were new vehicles. Amazing, since it would be a stretch if the road was 10 feet wide. One of the yards had broken glass bottles cemented on top of the 12 foot high fence. We assume this was so no one would scale this wall, and if he did get to the top he would be in big trouble. Some of the walls had electric fence wires on top. We were grateful the store we visited, no bigger than 8?x 8? had pop and chips. We bought hot seasoned peanuts thinking we could get some protein. To the south of our school was two houses under construction. A man came by and told that he was the owner of this school and that is was a private school. He also owned the second house under construction. He said there were three showers in this house and we were welcome to shower. We waited in line but, of course, by the time we got there the water was all gone. In our group there were three diabetics. Ashley scoured the town for a hospital and came back with the pills they needed. The first night a large dog, which looked like a cross between a German shepherd and something wild, appeared in the school yard. It turned out she belonged to the school. She kept out all the animals that did not belong in the school yard. There was also a school duck who survived the storm. Dark was approaching and we were getting prepared for our fourth night in the shelter when our pickup truck and a strange van came driving into the school yard. They announced we were going back to the hotel. The women and children were to ride in the van and back of the pickup truck and the men had to walk out to the highway. I was in the back of the pickup truck with maybe 12 other women. Eldon walked out. Our truck wandered through the streets of this little town (dark by now) for what seemed to be an eternity. Finally the truck pulled off on to the highway for a while and then off on a dark road. We thought our driver was lost. He wound around and we ended up at a bus just parked along the road. The bus was full of the younger people from our group who had walked out. We crowed into the bus and had to stand for the remainder of the trip to the hotel. The people who walked out, were told to go single file. They waded in water up to their knees, stepped over, under and through power lines. The bus Eldon was in had taken a wrong road and had to back up about 300 yards. The streets were full of trees, glass, power lines, etc. Had we been in the US, we would still be in that shelter. I can?t believe the things we drove over to get back to the hotel. Back at the hotel there was no electricity or running water. You could tell the lobby had been entirely gutted by water. We were given the key to the rooms our luggage had been moved to, along with a candle. The walk to the 5th floor was a challenge but we made it. Many of the rooms had at least one inch of water on the floor. Approximately 9pm the electricity came on along with cold water. We showered and were escorted to the basement employee?s lounge and kitchen for a wonderful meal. We snuggled in our bed around 11 pm for the most wonderful night of sleep. Monday morning breakfast at 9am was wonderful. 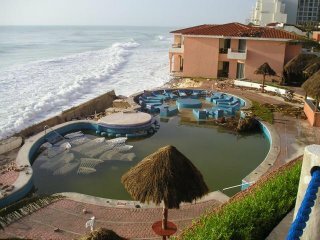 The barrier wall between the resort and the ocean was badly damaged. The three pools were not damaged. The employees that had been with us for the duration were bringing out tables and lounge chairs for our enjoyment. We felt fortunate and blessed. Our hotel was able to bring us back and they did. 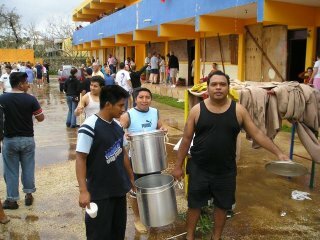 They fed us twice a day for the remainder of our stay, turned the generators on so we could have a shower in the evening, and even continued to send the maids to our rooms. We patiently waited for our trip home knowing 33,000 people wanted to go home as bad as we did and many of them were still in shelters. We played cards with our new-found friends and acted like we were still on vacation. Wednesday morning our call came. We left the hotel around 10:30 and finally arrived in Chicago at 8:30 pm. There is nothing like coming home to American soil. We had to then get a flight to Kansas City, finally arriving back to Omaha at 4am Thursday, October 27. We stayed the remainder of the night with Phyllis and Norman . We made it home to the ranch 5pm. Thursday. Through all this we had no news, no telephone, no TV, only rumors and hearsay. When we got to Norman?s, it had been one week since we saw a newspaper and when we turned the TV on at home, it had been one week since any news of any kind. Our special thanks to Conception, the Mexican lady in charge of our room, and to all the employees who took such good care of us. To the Funjet man who brought his family to the shelter and stayed with us. To the manager of the hotel who worked so hard to get us back to the hotel. These people were not worried about the hurricane because they knew exactly what needed to be done. 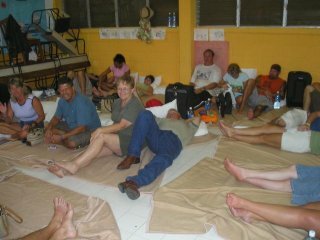 In a matter of two hours from the time we were told to evacuate, we were in a shelter.